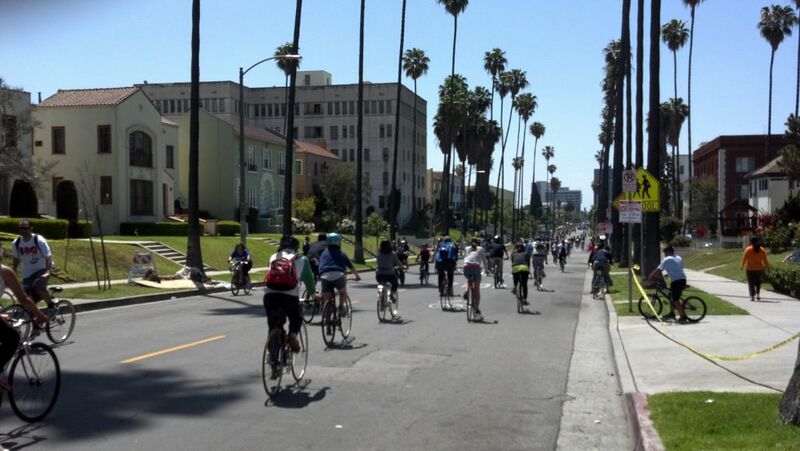 Bike riders with, and without, helmets at the April 2012 CicLAvia. Photo by Joel Epstein/Metro. Maybe it is the fear of helmet hair? With urban bike share programs popping up in cities across the country (L.A. is launching it own bike share program soon), civic leaders are struggling to find ways to encourage helmet usage. Problem is, bike share users are far less likely than regular riders to be carrying a helmet when they need one. Boston’s solution is to install sidewalk helmet kiosks selling inexpensive helmets at bike docks. Another obstacle to wider usage is mixed findings from the research on the effectiveness of helmet use. With more bikes on the road, watch for more public awareness campaigns aimed at increasing helmet use. With Phase One of the Expo Line up and running, local businesses along the new line are hoping to attract new customers. KPCC speaks with business owner Cary Earle of Earlez Grille who says, “We need that. It’s going to be good for the community. It’s going to bring a lot of jobs… [and] it’s going to bring a lot of people to the community that don’t necessarily come to this community.” The report also cites a transportation and urban planning professor from USC who feels the next decade could be a threshold changing decade for public transit in Los Angeles. A recent report entitled Failure to Act, from the the American Society of Civil Engineers (ASCE), asserts that the United States needs to spend $1.7 trillion in the next nine years to shore up the country’s roads, bridges, and water and sewer lines. Still, this costly issue is receiving relatively little attention from the presidential candidates. According to Andrew W. Herrmann, a Pittsburgh-based engineer and president of the ASCE, the last serious investment in infrastructure dates back to Franklin Roosevelt and Dwight Eisenhower — more than 50 years ago. Whether it is a tricycle, bicycle, moped, scooter, motorcycle, or trike, not wearing a helmet is a just plain stupid. It’s just like a seatbelt for the car; it’ll save your life. Sure good helmets aren’t cheap, but that’s better than sustaining severe head injury, or worse, even your life. @ Y Fukuzawa: Can you show us studies that backs your claim? Because you might be surprised what you find. Or don’t.